The first official photo from Wednesday evening's Wizarding World of Harry Potter press event, including a spectacular fireworks show before the cast, crew, fans, press, and orchestra led by John Williams has been released, and can be seen in high-resolution in our galleries. 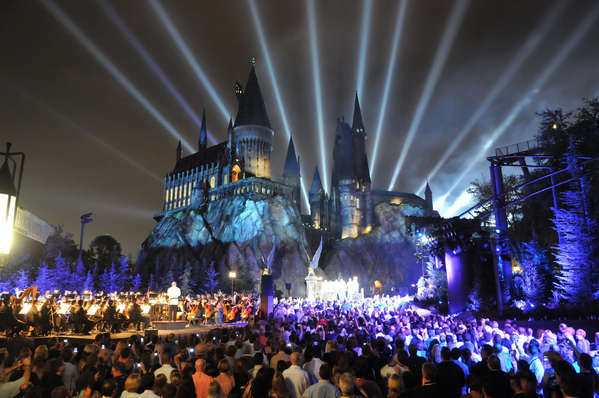 SnitchSeeker also has photos from the event, including the cast's introduction, the fireworks show, John Williams and Warwick Davis conducting the orchestra and choir, and much more. A report featuring the photos will be released later today. Additionally, SnitchSeeker will be attending several press conferences later this morning, including those with Dan Radcliffe, Rupert Grint, Bonnie Wright, James and Oliver Phelps, Tom Felton, Micheal Gambon, Matthew Lewis, David Heyman, David Barron, Alan Gilmore, Stuart Craig, and much more. The full report on that will be up after. SnitchSeeker will be live-tweeting during the conference; for updates, follow us here. SS you put in so much effort for everyone! That is SO EFFING GORGEOUS. SS, you and your WWOHP news makes me want to run off to the airport and go... now! Woooohaaaaaa...I'm speechless..The Firework look AMAZING..!!! Completely jealous of who's attending but looking forward to my 21st Birthday. I think you all know where I am heading for my 21st Birthday! I'm heading to Florida. "It's not who you are that holds you back, it's who you think you are not." Incredible. It looks like they have really done a great job. I'm supersizing that photo and it's going above my bed on the ceiling so I have WONDERFUL dreams when I go to bed. I would love to go there someday.